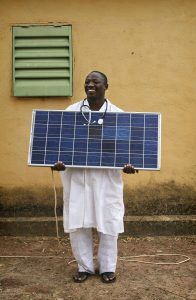 In order to protect local and global health from climate change and its sources, the world needs to move toward an economy based on clean, renewable, healthy energy. Indeed, a transition to a clean energy economy will benefit both the climate and people’s health. Health care can contribute to this transition by decarbonizing its energy consumption, operations and supply chain, reducing its climate footprint in alignment with the ambition of the Paris Agreement on climate change. Today more than 180 institutions representing the interests of over 17,000 hospitals and health centers from more than 26 countries, have joined the Health Care Climate Challenge and committed to taking meaningful action. By 2018, Challenge participants had collectively reported commitments to reduce their carbon emissions by more than 16 million metric tons—the equivalent of both a year of carbon emissions from 4 coal fired power plants , and of saving an estimated U.S. $1.7 billion in health costs related to air pollution. Participants also report saving U.S. $381 million through energy efficiency and renewable energy generation. 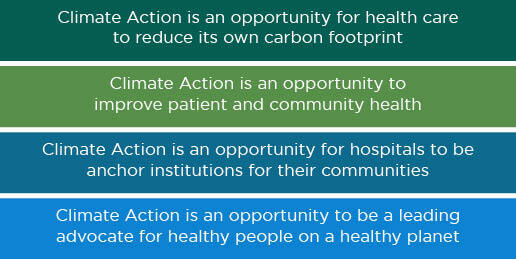 Mitigation – Reducing health care’s own carbon footprint and/or fostering low carbon health care. Resilience – Preparing for the impacts of extreme weather and the shifting burden of disease. Leadership – Educating staff and the public while promoting policies to protect public health from climate change. Many of the initial participants have set ambitious mitigation targets of 30% or more carbon reduction. Yet all hospitals, health centers and health systems from everywhere in the world are encouraged to participate and help foster climate smart, low carbon care. 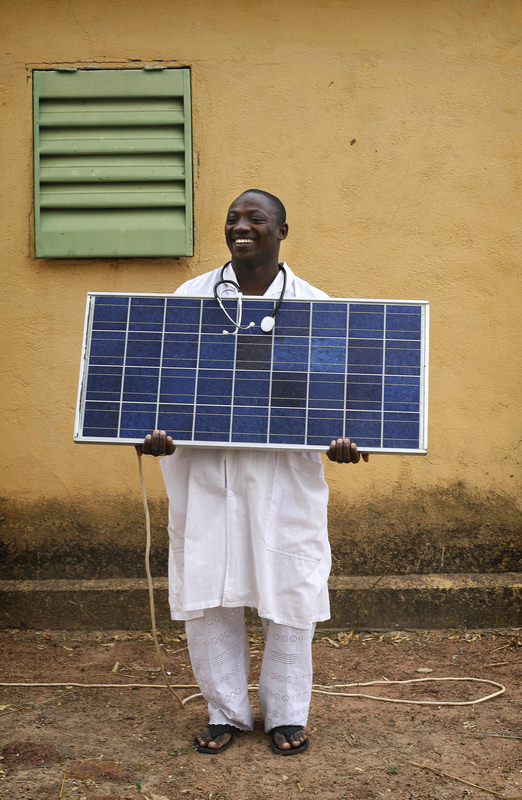 By moving toward low carbon health systems, health care can mitigate its own climate impact, save money and lead by example. By becoming more resilient, health care can help prepare for the growing impacts of climate change. And by providing societal leadership the, health sector can help forge a vision of a future with healthy hospitals and healthy people living on a healthy planet. At this crucial juncture, the time to act to protect public health from climate change is now. Any hospital, health system, or health organization can join the Health Care Climate Challenge Challenge. By doing so, they are granted automatic membership in GGHH. If you are not a GGHH member and agree to participate in the challenge by signing the climate pledge (below), your institution will receive an automatic membership in GGHH, and with it, access to tools and resources, including our online collaboration platform, GGHH Connect, and Hippocrates Data Center. Non-members joining GGHH through the Health Care Climate Challenge will be required to submit a letter of intent to join the network before being accepted.